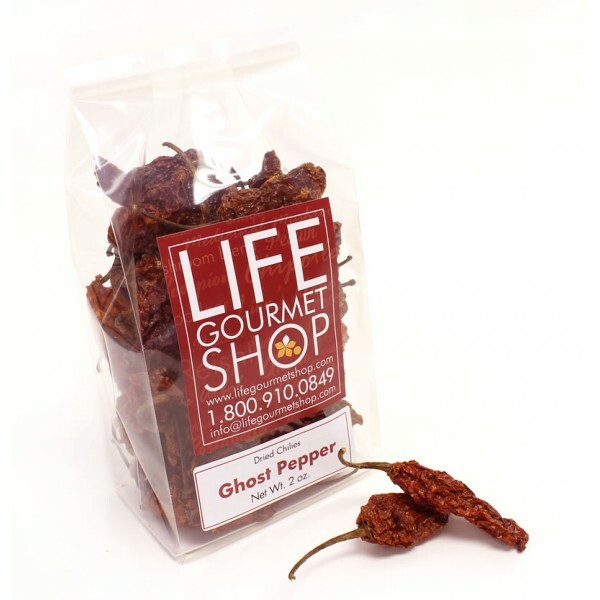 > Dried Chilies>Ghost >Dried Ghost Pepper 8 oz. Dried Ghost Pepper 8 oz. 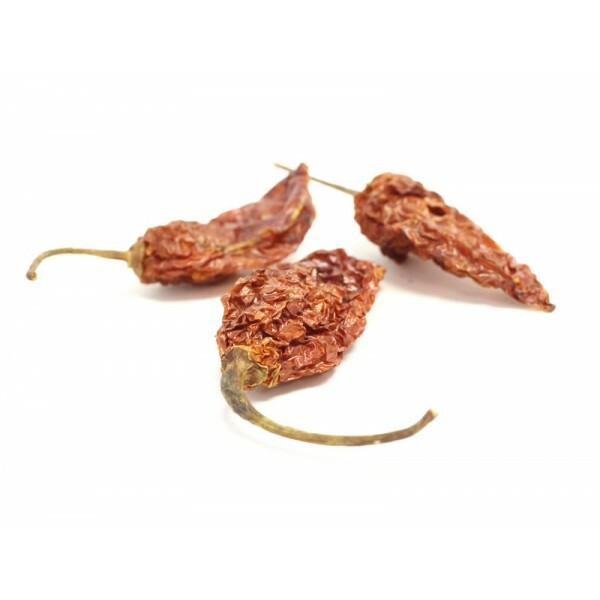 India grows the world's hottest pepper called Ghost Chili or "Bhut Jolokia". The Guinness World Records crowned the Ghost pepper as the world's spiciest chile in 2007. India grows the world's hottest pepper called Ghost Chili or "Bhut Jolokia". Also called the Naga Jolokia, after the famous Naga warriors of Northern India, who were fearsome headhunters. The Guinness World Records crowned the Ghost pepper as the world's spiciest chile in 2007, dethroning the red savina habanero. It has been measured at 855,000 Scoville units up to 1,041,427. Always remember to wear rubber gloves when handling chiles! With the intensity of the pepper able to create a very strong pain sensation lasting up to 30 minutes, one should eat the Ghost pepper with extreme caution. Also, when handling the Ghost pepper, one should take caution as to not get any in or near the eyes as the pepper can create a very intense burn. Please handle this chili with care. They can be use in chili sauces and stews. 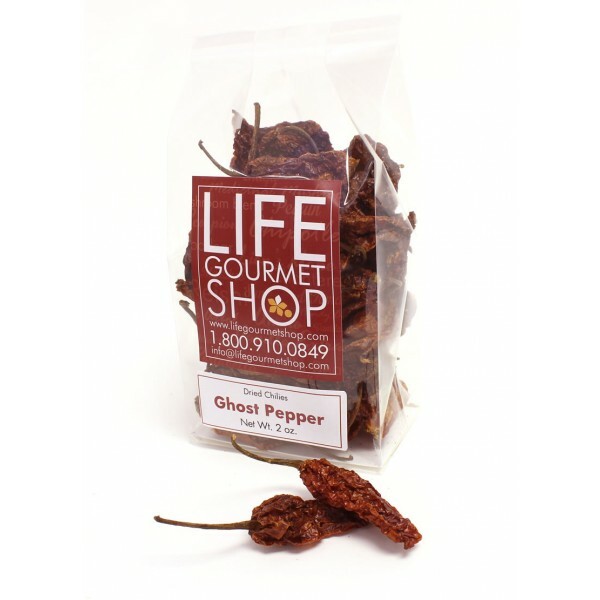 Hot peppers like the ghost pepper are low in calories and high in nutrients. Chili peppers trigger the process of thermogenesis, by which cells turn fuel energy to heat. Capsaicin alters the usual activity of a muscle protein called SERCA, causing it to burn off energy as heat. Eating capsiate increases feelings of alertness, leading people who eat it to feel more awake and energized by triggering an adrenaline response. The pepper’s capsaicin has been proven to kill cancer cells, prevent sinus infections, serve as an anti-inflammatory agent, provide gastric relief and produce fat oxidation. You should always wear gloves and handle Ghost Peppers with extreme caution. We suggest wearing gloves, goggles, a mask, and long sleeve shirts when handling the product. Even the smallest amount on your skin will cause you extreme irritation. The peppers are most commonly used in salsas, sauces and chili. Keep in mind only a very minimal amount of the pepper is needed to make a massively hot impact. Stem and seed the chiles, then place them in a skillet, on a comal, or in a 250 degree oven and dry-roast them for three to four minutes. Shake them once or twice and be careful not to scorch them or else they will taste bitter. The chiles should then be added to water that has been heated to just below the boiling point - if it is boiling, the chiles will lose flavor. Use just enough water to cover the chiles and press them down with a lid. Allow them to sit for 20 minutes or until they are soft. 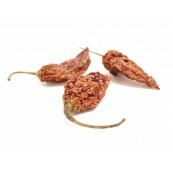 To reconstitute dried Chili pods, remove stem and seeds. Place chiles in a pot of water that is just about to boil. Remove from heat and allow to soak for 20-30 minutes or until tender. Once chiles are reconstituted, place in a blender or food processor to chop. Store dried chiles (and chile powder) in an airtight container in a cool, dry, dark place. Although it is possible to store them for extended periods of time, it is better to use them within six months. If you do keep them longer, check through them occasionally and discard any that have spoiled. Dried Ghost Pepper 1 oz. Dried Ghost Pepper 2 oz. 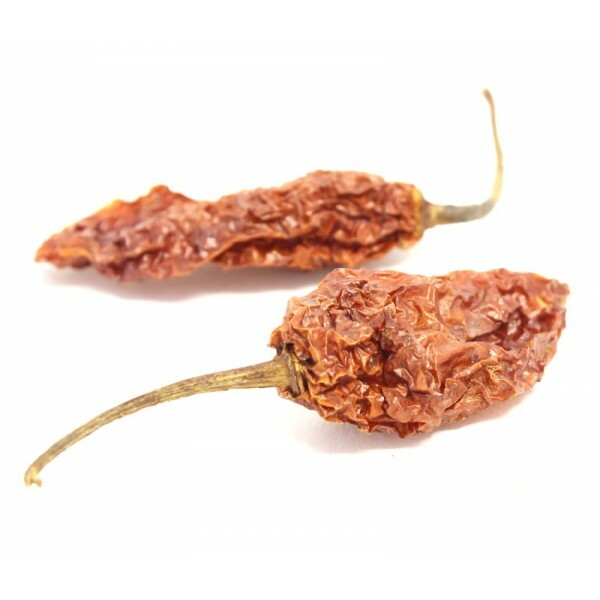 Dried Ghost Pepper 4 oz. Dried Ghost Pepper 1 Lb.